Making a delicious smoothie can be a hassle. You need to select the right combination of ingredients, purchase them at the store, and then prepare them for your smoothie. That means you’re washing, chopping, and measuring. It can be messy and time-consuming. In the end, you could wind up with a nasty smoothie if your recipe didn’t go to plan. Live Pure was founded by Mary Cope and Tiffany Tatom, two women who are certified health coaches. They originally developed their smoothie delivery service for clients, but in an effort to make smoothie creation easier and faster, they created smoothie cubes. And now, they’re passing that convenience onto you through their Live Pure service. 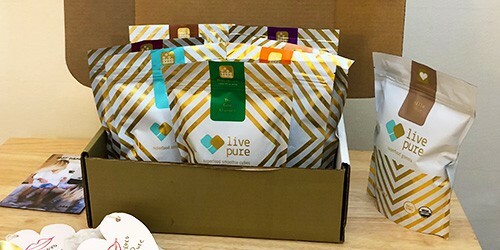 To get started with Live Pure, you have three different options to consider when placing your first order. You can try their Sampler Pack, which provides you with different flavors to try all in one order. It’s a great way to test out the service and their smoothies before committing to a larger purchase. The Sampler Pack gets you 14 smoothies, which means you receive two of every flavor they offer. You also have the option to completely customize a one-time order. This gives you the ability to select the flavors you want and skip the ones you know won’t be for you. And you’ll be able to choose between three, four, or five flavors in your box. However, if you’re ready to make more of a commitment to Live Pure and their smoothie cubes, the subscription option would be ideal. This gets you monthly deliveries of your favorite smoothie flavors, which is convenient and saves you some cash on shipping. Although it’s not necessary to sign-up for a monthly subscription, it does have its benefits. Chocolate PB&J: These smoothie cubes contain cacao powder, strawberries, peanuts, cinnamon, maca, bananas, dates, and probiotics. It’s great for anyone looking to satisfy their chocolate cravings without eating candy, while also getting a nice energy boost. The Game Changer: These smoothie cubes contain spinach, cashews, bananas, probiotics, peanuts, cinnamon, and dates. This shake is packed with protein (16 grams), making it a perfect post-workout drink. Skinny Peach: These smoothie cubes contain peaches, coconut, ginger, bananas, raspberries, apples, turmeric, and camu camu. This blend, especially with the addition of turmeric, is the perfect way to detoxify and reduce inflammation. The Churro: These smoothie cubes contain cinnamon, cacao nibs, dates, lucuma, cashews, bananas, himalayan pink sea salt, and maca. This blend of superfoods make for the perfect sipping snack to bust sugar cravings in a healthy way. Pitaya Protein: These smoothie cubes contain pitaya, maqui berry, strawberries, mulberries, spinach, almonds, garden of life protein, bananas, and probiotics. If you’re unfamiliar with any of the lesser-known ingredients, like pitaya, I’ve linked to sites with more info on each. Mint Cacao Chip: These smoothie cubes contain cacao powder, cashews, maca, bananas, spinach, cacao nibs, mint, and dates. If you’re a fan of mint chocolate chip ice cream or thin mints, you’re going to love this flavor. It’s a personal favorite. 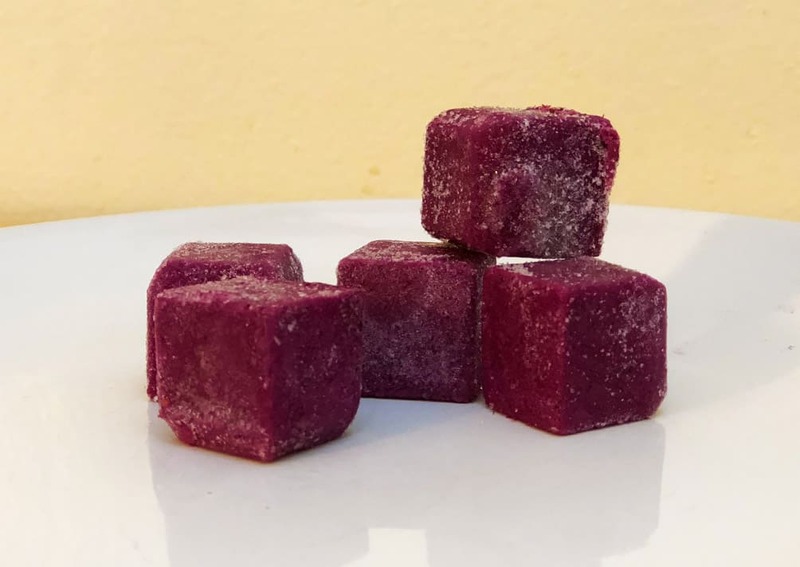 Acai Maqui: These smoothie cubes contain acai berry, raspberries, blueberries, bananas, probiotics, almonds, strawberries, maqui berry, and lucuma. This blend is perfect if you’re a fan of tropical fruit smoothies. For delivery, Live Pure offers shipping everywhere within the continental United States. You can choose from three-day shipping or pay an additional cost for overnight shipping. Shipping totals will be calculated at checkout, so you’ll be able to see how much it’s going to cost before making your payment. It is worth pointing out that you can avoid shipping charges by signing up for a monthly subscription, which means you can save $180 over the course of a one year subscription. That’s a $15 savings every single month if you want regular deliveries from Live Pure. To keep your smoothie cubes cold during transit, they will be placed in a box with a thermal liner, as well as dry ice. It’s important to exercise caution when disposing of the dry ice inside your box—if touched with bare hands it can hurt. The thermal liner is eco-friendly and 100% recyclable. Live Pure encourages customers to do their part and recycle packaging to give back to the environment. They’re definitely a lot more environmentally conscious than some of the other meal delivery companies out there. You might be wondering what kind of ingredients go into these smoothie cubes. And fortunately, Live Pure discloses all the nutrition information for each one of their products. That means it’s never a guessing game, wondering what could be lurking inside them. You can feel good about the quality of ingredients they use. Their smoothie cubes are made with 100% USDA organic fruits, vegetables, superfoods, and probiotics. And they work with suppliers who have high quality standards. You might be thinking that frozen fruits and veggies aren’t as nutritious and flavorful as non-frozen ones. We once thought that. However, based on our taste tests, it was hard to tell that these smoothies were even once frozen. This is because all of the fruits and veggies are flash-frozen at the peak ripeness. This process helps to preserve their nutrients, while also maintaining their flavors. There’s a good chance you’ll be so excited to make your first smoothie once your order arrives on your doorstep. The only downside is you won’t be able to blend up something delicious right away. As mentioned above, dry ice is stored with the smoothie cubes during transportation to prevent melting. And that means they’ll be a little too frozen once they first arrive. If you do want to enjoy a smoothie the same day, all you have to do is let the smoothie cubes sit on the counter for about 20 minutes. Then, they’ll be ready to blend! Otherwise, you can store the cubes in your freezer and enjoy them the next day. Once you are ready to create your first smoothie, the process is incredibly easy. You simple need to add the cubes to your blender, along with your chosen liquid. Live Pure recommends using organic, unsweetened almond milk, coconut milk, or cashew milk. But you can also use coconut water or filtered water, or dairy milk, depending on your preferences. I ended up using almond milk for most of my smoothies and they tasted delicious. You simply need to blend the smoothie and the liquid for 20 seconds. Keep in mind that the longer you blend, the thinner the consistency will get, so it’s recommended to do no more than 30 seconds. Next, scoop everything into a bowl, and add your toppings. You can top it off with additional fruits or granola for a bit of a crunch. The final step is just to enjoy your delicious smoothie :)! If you’re a smoothie lover, it’s safe to say you’re going to enjoy these smoothie cubes. Not only do they make smoothies so much easier to whip up, but they taste delicious. There’s no need to guess on ingredients and serving sizes when creating your Live Pure smoothies, which takes a lot of the hassle out of making them. Plus, you can feel good about eating them, knowing they contain high quality ingredients and no artificial sweeteners. That’s something that can’t be said for most of the smoothie chains around the country. If you’re a chocolate lover, you’re really going to enjoy the Chocolate PB&J smoothie cubes. With strawberries, cacao, cinnamon, and bananas, it’s rich and flavorful. To be honest, I didn’t even realize that it’s good for you until I started reading the ingredient list—it tasted like a chocolate shake with a little added peanut putter. Another favorite of mine is the The Game Changer. It has more protein than many of their other smoothies, making it the perfect post-workout shake. For me, convenience is key when I’m exhausted after the gym. As mentioned above, you have three different options when purchasing from Live Pure. You can choose their Sampler Pack, which allows you to try all the smoothies they currently have in their store. It’s $99 to order the Sampler Pack, which comes to $7.07 per smoothie that you receive because you’ll get 14 smoothies in the order. 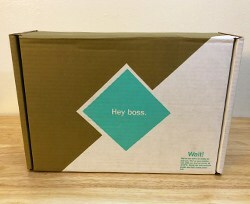 If you’d prefer to customize your order or go with a monthly subscription, you have three choices. You can select between three flavors of smoothies, four flavors, or five. If you go for three flavors in your box, you’ll receive 18 smoothies for a total of $125.82. An order with four different flavors gets you 24 smoothies at $162 for the box. And five different smoothie flavors will get you 30 smoothies for $195. Of course, you will have to pay shipping fees if you go for a one-time order. You can save cash on shipping by committing to the monthly subscription. If you’re on the hunt for an easier way to enjoy a delicious smoothie, Live Pure is worth checking out. 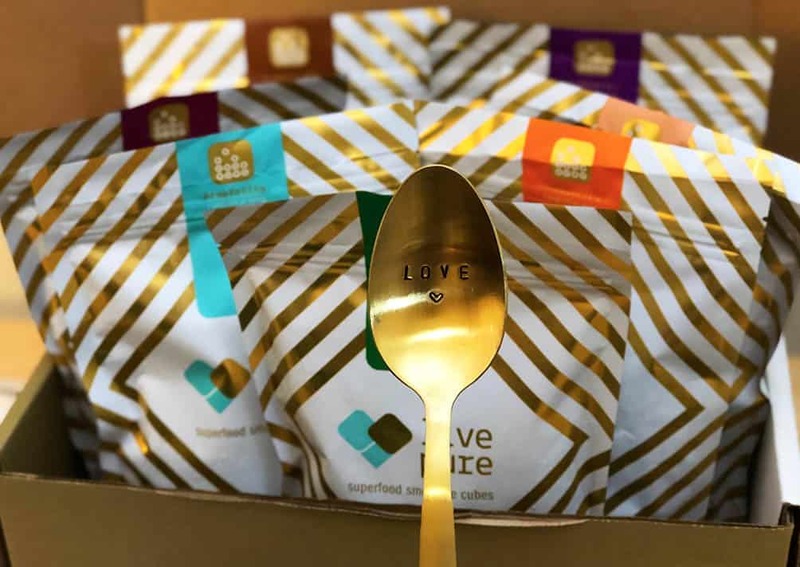 While there are other smoothie services out there, Live Pure is different in that it comes in these convenient pre-made smoothie cubes. However, you’re still getting the delicious taste and healthy ingredients that many of the other services provide. Based on my experience, all it takes is 20 seconds and you’ll have a delicious smoothie shake to enjoy. These little cubes have saved me a lot of time in the morning when I want to eat healthy but don’t have a lot of time to spend making breakfast. 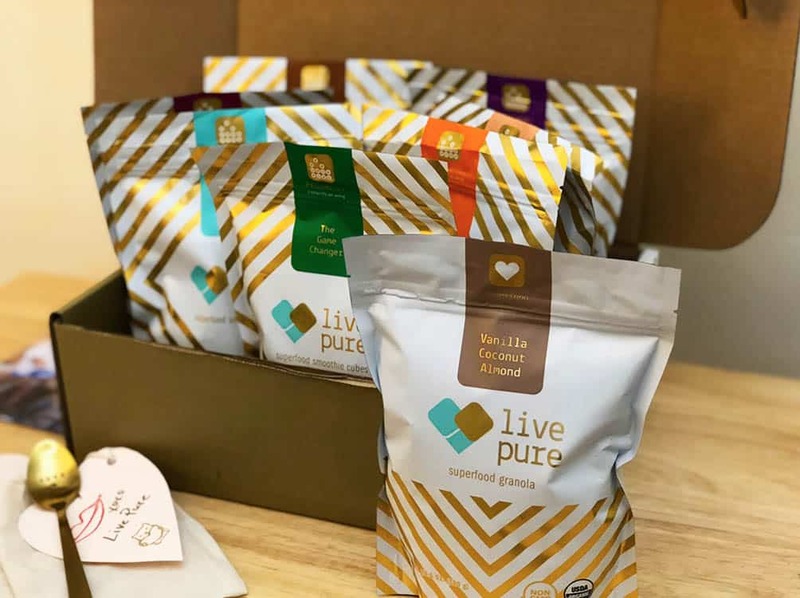 Disclaimer: Live Pure sent us a box of smoothie cubes to try for our honest opinion. We were not paid to create this review. Have a question about Live Pure or smoothie delivery in general? Leave a comment below and we’ll get back to you ASAP!